I read an article recently about foods that we should "break up" with. Some are quite obvious, such as white flour and processed meats. White flour because it lacks any nutrients and causes a spike in blood sugar levels. Processed meats because they contain saturated fats and unsavory fillers. Others are not too obvious, for example, dried fruit. Fruit, both fresh and dried are good for us, no? It turns out that some dried fruit preparations can contain added sugar and corn syrup, extra sources of glucose that most of us do not need. 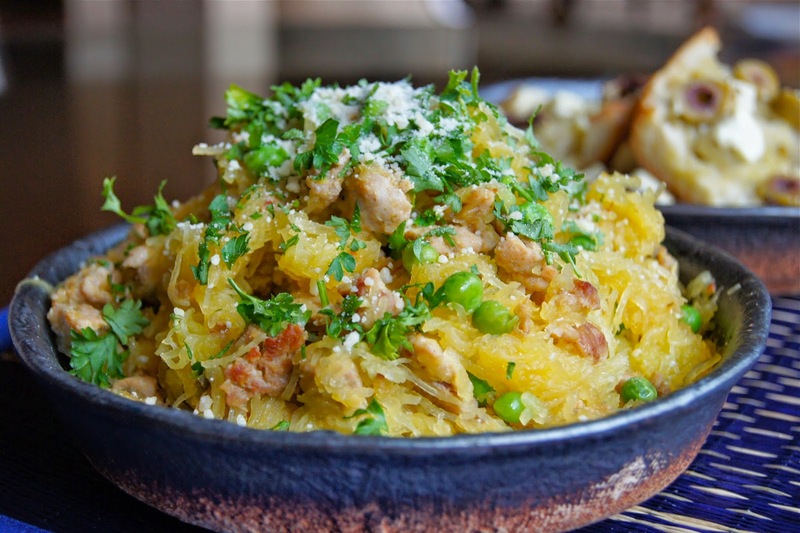 Today, I am "breaking up" with spaghetti squash but not for any of the reasons you might think. This recipe has been overdone at our house. It is one that I have been making almost bi-weekly since last fall. So I think it is time to give it a rest, for fear that my hubby will never want to see another spaghetti squash again. If you do get to try this recipe, you will surely agree that its ease of preparation and simple healthfulness make for a wholesome weeknight meal, and I'm sure you will understand why it become a go-to recipe at our house over the last few months. 1. Carefully cut the squash lengthwise in half. Brush the cut sides with a little oil and place cut side down of a baking sheet. Bake in a 350 degree F oven for about 20 minutes until the spaghetti threads can easily be removed with a fork. 2. Cook the sausage in a skillet over medium high heat, for about 10 minutes, trying your best to break up any large chunks into small bite-sized pieces. 3. Once the sausage has been properly cooked, add in the spaghetti squash and the peas. Combine well. Season with salt and pepper. 4. Transfer to a serving dish and top with grated parmesan and chopped parsley.